As mentioned last week we have been working on an apocalypse battle report. The battle was a huge amount of fun. 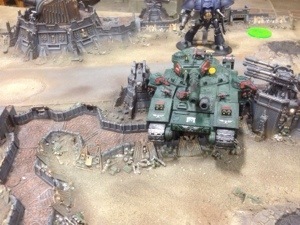 It features a Devastator company and Warhound facing off against 5000 points of Grey Knights with a BaneBlade and Knight Errant. The ending you won’t see coming, but it might remind you of Black Adder goes forth. It’s now very near completion so check back tomorrow morning. I can’t promise to live up to the old White Dwarf battle reports, but even with only three turns, I can promise a higher word count than this month’s issue of Warhammer Visions. 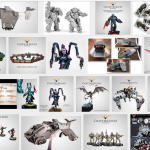 The Thunderhawk Parting shot – How much longer will we be fooled? The Best Battle Report Ever on Chapter Masters?